So it is official that Airtel will roll out TD-LTE (Time Division Long Term Evolution) based 4th generation mobile broadband services in Kolkata in this month. We also suggested that tariffs of Airtel 4G would be affordable as in that way they can bring mobile revolution. Though our readers are not keeping hopes with Airtel as the largest operator in India believes in premium pricing. Recently GSMA predicts that within 2016 India will be the second largest wireless broadband market. It is not unnatural, as fixed broadband penetration is not good enough in India due to several factors like poor coverage by private players, monopoly of BSNL in fixed broadband market and pricing. So to offer broadband for all it is the better way to use wireless route to reach everyone. India was late to enter 3G era, 3G is still not a good business case for operators as well as for consumers mostly due to high tariff and moderate coverage. Also operators are not pushing 3G, as they do have only 5 MHz spectrum more 3G users may lead to network choked. Handset pricing is another issue for 3G adoption. But with 4G there is not much delay as LTE started its journey by Teliasonera in Sweden & Norway in Decemeber 2009. India operators chose LTE over WiMAX. Currently most operators worldwide are commited to LTE deployment as the natural upgrade path from GSM/UMTS and CDMA. In India BWA spectrum (20MHz x2) auctioned was in 2300MHz band, which is suitable for LTE-TDD. LTE-TDD is not a Chinese technology, rather inception of LTE-TDD was by 3GPP partners but the technology is hugely backed & matured by China Mobile. In the beginning of 2011 China Mobile had done their field trial but yet to offer commercial services. TD-LTE works via asymmetric use of unpaired spectrum – one band of spectrum for downlink and uplink. Another version of LTE is FDD-LTE (Frequency Division Duplex) which uses dual band of spectrum – different band for downlink and uplink. Currently all commercial deployments of LTE are done using FDD-LTE. As a result the ecosystem behind FDD-LTE is more developed. As far as nearly 300 devices are available for FDD-LTE, as reported by GSA. Indian operators especially RIL Infotel is taking LTE as fixed broadband alternative. Even Airtel has the plans to do same. If we check global scenario we can see Vodafone Germany is also on the way to dump DSL to propel LTE. But only problem in India is the spectrum band. In Germany two band of spectrum was auctioned at the same time – 800MHz and 2600MHz. LTE on 800MHz means it will provide more coverage. So in Germany LTE-2600 is taken for urban broadband while rural broadband is on LTE on 800MHz. But here BWA players got spectrum on 2300MHz band which will not provide good coverage and indoor penetration. And at this initial stage LTE coverage in India will be limited, may be in pockets and small cells will be deployed for better indoor coverage. If LTE tariff is not high and made affordable for dongle users, LTE can hit 3G and EVDO based dongle users in India at very first. If we look into South Korea, there all the 3 operators (LG U+, SK Telecom and KT) are now on LTE and that’s too on 800MHz. Thus operators in Korea are pushing for LTE adoption, 3G is backdated there. But it does not mean India should auction 700MHz spectrum for BWA in a hurry. 2G scam made the whole telecom system in India unstable, foreign investors are not so keen to invest in Indian telecom market. So 2G auction should be done first and then question about 700 MHz BWA auction arises! Rather we should wait for 2-3 years to mature TD-LTE on 2300MHz in India and then to push for rural wireless broadband via 700MHz LTE. Also note that LTE on 700MHz spectrum will be FDD type.OEMs who will supply devices for Indian LTE roll out, must be highly negotiated by operators to make the device price at a low level. Because Indian market is highly price sensitive. So tariff and device price should be made affordable. 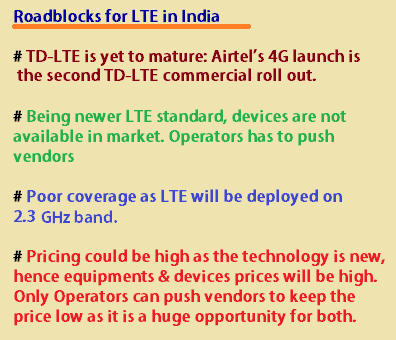 As coverage of LTE in India is expected to be poor at this stage, smartphones will not do good. Even if only 3G & 4G compatiable phones are offered it will not do good as no operators has pan India 3G spectrum and 3G coverage is still poor. Also TD-LTE requires more power than FDD-LTE. So tablets and dongles are the safe bet right now. Dongles must be multimode (2G/CDMA/3G/LTE) supported. As Infotel entered in several partnerships, it is expected that Value Added Services like e-Edu, Entertainment, Mobile TV etc will have attractive bouquets for 4G customers. Now what do you think about LTE roll out in India? 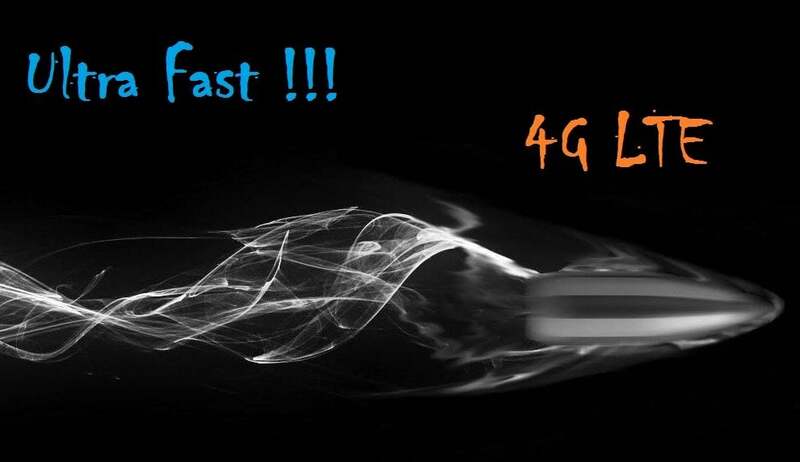 Will it be a gala success or future of LTE will be just like 3G? usb dongle might not be successful due to coverage issues,whereas indoor modem or outdoor modems will certainly restrict mobility also these modems might be 3 to 4 times costly then adsl modems,also i see 4g only a viable option where conventional dsl broadband is either not present or customer want only wireless internet that is fast too,surely success of 4g depends solely on operators strategy.As far as speed is concerned numbers shown are theoretical(this is my personal view due to past experience). @WiMAX tata docomo 4g is not in scene atleat till other auctions are held.